Welcome to Old San Miguel Mission, the Catholic Church in Socorro, NM. 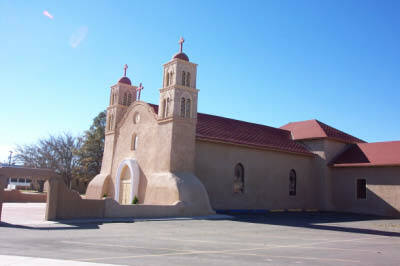 San Miguel is a vibrant parish in the heart of central New Mexico. Our mission is to strive to bring people closer to God. We, the faith filled members of the Parish and its Missions, part of the Archdiocese of Santa Fe, find strength, unity and grace in the celebration of the Holy Sacrifice of the Mass. As the voices and hands of Jesus in our time, our purpose is to express God's grace by offering Christion Love and Service to each other and to everyone we meet. We reach out to the world in prayer, action and deeds in unity with the Holy Roman Catholic Church.